A quality LED flashlight is an important everyday carry item. It can save you from a thug or help you change your spoiled vehicle tire. But not every tactical flashlight on the market is worth buying. There are those that are sturdily made and will perform excellent. Some will even not light in a very cold environment. It is good to look at reviews to know which brands and flashlights are the best to have. In this surefire 6Px pro review article you will able to learn it is worth buying or not. With so many brands on the market, it is good to select from the best. Surefire is one of the top brands with outstanding tactical flashlights. They have tactical lights for ever day use, outdoor enthusiasts, weapon lights, and many other types. In this post, we will look at one of their most versatile tactical light on the market. This is the surefire 6px pro flashlight. The surefire 6px light is sturdily constructed from high strength aerospace aluminum body. Being a strong and lightweight material, aluminum can resistant impact and it’s also weatherproof. It weighs just 5.8 ounce which is wonderful for such a quality light. Also, it has an LED emitter which produces an excellent beam. The maximum lumen is 320 and lowest is 15. If you want the torch to run for long, then you will have to utilize the 15 lumens. Surefire 6px pro is very easy to use with the dual output tailcap switch. It can be pressed for momentary on or constant on light. The brightness of the flashlight is supported by the precision micro-textured reflector which forms a smooth and optimized beam. The grip is firm and makes using the flashlight to be simple. Surefire 6px pro led light runs on two CRA123A batteries. So, have some spare batteries if you intend to use the flashlight for very long hours. The surefire 6px pro is a quality light made from high strength aerospace aluminum body. This is a very strong material. It can resist impact or even crashing. Also, it is lightweight and carrying it won’t be a problem. The torch is ergonomically built for easy use. It is sleek and has a nice grip for easy holding in the hand. Also, it is of an ideal length as it’s not very long or short as some models on the market. Surefire 6px pro uses LED bulb. This is a very strong and reliable bulb. The LED emitter is indestructible even if the torch falls down or crashes. So, it can be relied on to provide light in the toughest of conditions. The flashlight can run for several hours depending on the use. If it’s running on 15 low lumens, then you will use it for over a long period of time. But if it’s running on 320 max lumens, then you will use it for a short period of time. The torch is very easy to use. It comes with a dual output tailcap click switch. So, you will just have to press the momentary on low, click for constant on low, then return to off then press or click again high. The flashlight is versatile in use as its tactical nature allows it to be used at home or for outdoor activities. 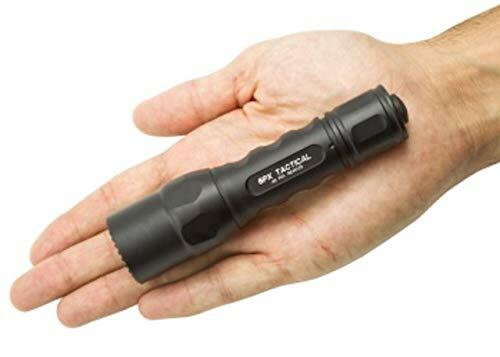 Hunters, anglers, law enforcers or even the military can use this flashlight. Every flashlight brand has its trademark. With surefire, it is famously known for creating durable and long lasting flashlights. Surefire ensures that the led flashlights it creates meet the military standard. A good number of the best tactical flashlights are built by surefire. They use aluminum material to create most of the flashlight with nitrolon polymer to build the small or keychain size lights. The surefire 6px pro is constructed from hard anodized aluminum. The surefire brand offers some of the best designs. Their lights are compactly and ergonomically created to fit the needs of the user. Whether it is an edc, tactical flashlight or weapon light, surefire makes sure that it fits the needs of the user. EDC lights are small while tactical lights are bigger. The surefire 6px pro is a great example of a tactical light. It fits perfectly in the hand and it has a nice grip for total control even when running. LED bulbs have changed the way flashlights produce light. Not only are LED bulbs brighter than incandescent bulbs, but they are as well durable and can withstand shock and impact. Surefire uses LED chips in its flashlights instead of incandescent bulbs. As a result, their lights are durable and offer a longer lifetime. Also, LED chips are brighter and use less energy to produce light. This is the bulb that you will find in the surefire 6px pro led light. Since flashlights are normally used in outdoors, it is important to know if the torch that you’re acquiring can withstand the harsh weather or not. Aluminum and polymer materials are durable and don’t allow water or dust to access the internal parts. Also, some additional features are used such as O-ring and gasket seals to prevent damage of inner parts. If you intend to use a flashlight for a very long period of time, then you should always consider its runtime. Surefire has different flashlights with most of the having a longer runtime. The runtime of a light is determined by several things such as the mode of light and type or power of the battery being used. Lithium batteries run for longer periods when compared to alkaline batteries. Surefire offers lithium batteries of its own which are powerful. One of the great things about Surefire flashlights is that they can be used for various purposes. For instance, the surefire 6px pro led flashlight is great for use indoor and outdoor. Hunters, law enforcers, military, anglers, hikers, and campers, can use this torch. Surefire offers different flashlights on the market, but the surefire 6px light is one of the best. This flashlight has a sleek design and is compactly created to perfectly fit in your palms. The hard aluminum body ensures that you use it for years to come and the LED bulb provides great illumination. In addition, the flashlight is very easy to use the dual tailcap click switch that it has. With a maximum of 320 lumens and a minimum of 15 lumens, this flashlight can be used for various purposes such as hunting, fishing, security, and hiking. Hope you’ve found this review about the surefire 6px pro to be very helpful.